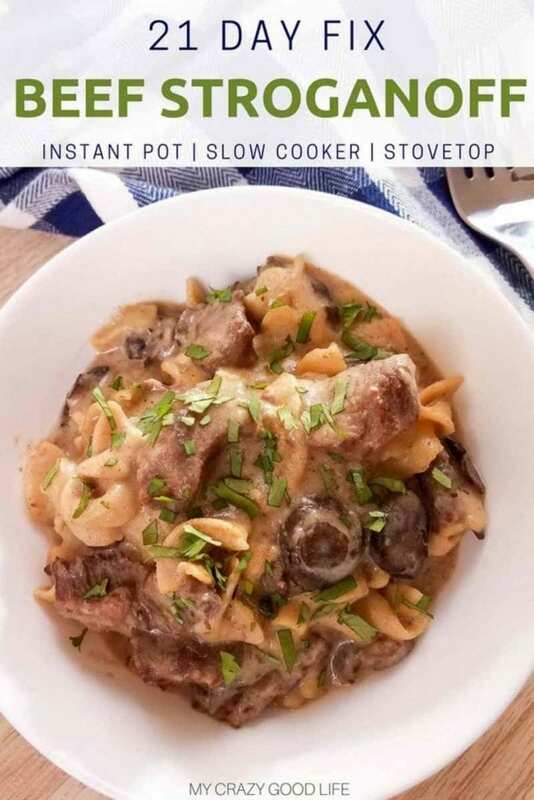 This Healthy Beef Stroganoff is so delicious and the whole family will love it, hello to all the meat lovers out there! This is a hearty meal that has been lightened up so you can even enjoy it on the 21 Day Fix. You know I’m all about making healthy eating and the 21 Day Fix as easy as possible, right? Well this recipe is one of the ways that I put those tricks to work in my own home. My family loves this dish. Do you love versatile recipes that you can prepare quickly and easily during the week? I do! 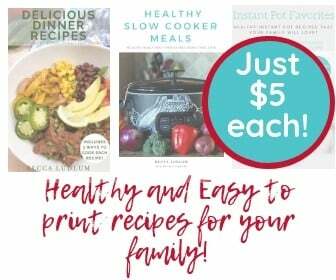 If you are looking for more great, healthy meals that the whole family will love…look no further! 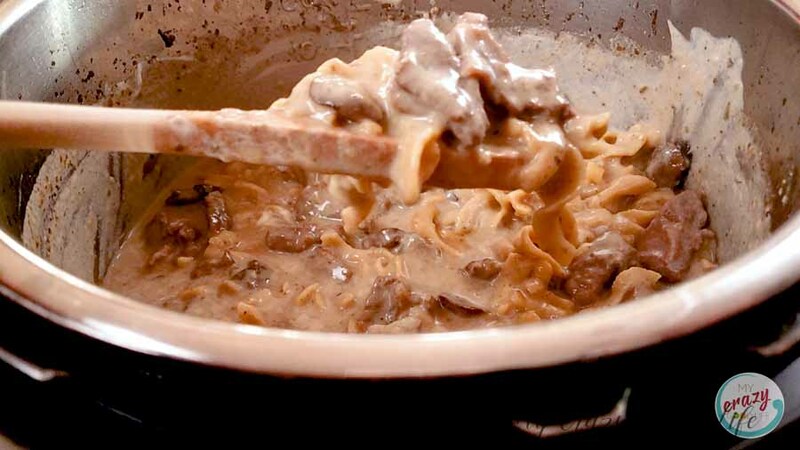 Healthy Beef Stroganoff Is Easy To Make! I’ve been doing this a lot lately so maybe you’ve caught on…This recipe can be made in the Instant Pot (my personal favorite), in the Crockpot (tried and true), or on the stove top (classics for the win)! 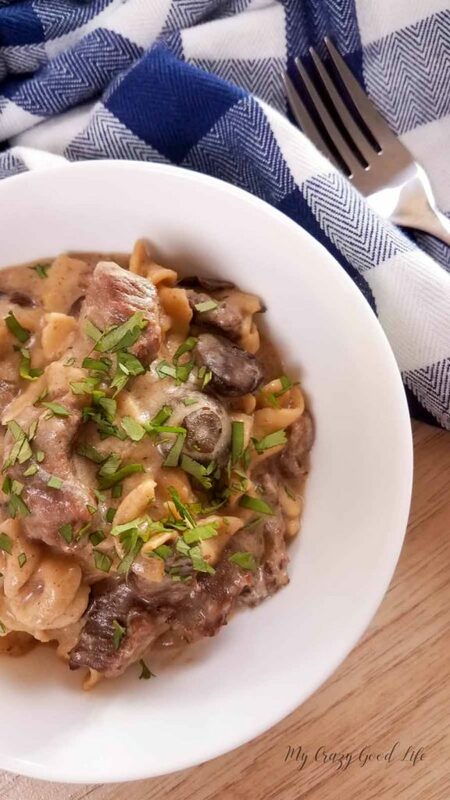 No matter how you prefer to prepare your meals you can take advantage of this healthy and delicious and healthy beef stroganoff recipe. I’ll share the directions for all three versions and you can decide for yourself which one works best for you! 1) Turn the Instant Pot to sauté. Add olive oil. When the olive oil is hot add the garlic, onions, mushrooms, beef, salt, pepper, and Italian seasonings. Sauté for 3-5 minutes. 2) Next mix in the aminos, beef broth, and egg noodles. Close the lid and turn the pressure valve to sealing. Cook on high pressure for 8 minutes. Let the pressure release naturally. 3) Remove the lid and turn the Instant Pot back to sauté mode. Slowly stir in the brown rice flour to thicken the sauce. Once the sauce is thickened mix in the plain Greek yogurt. Garnish and serve. 1) Sauté onions, garlic, mushrooms, and beef in a skillet on the stove for 3-5 minutes. Transfer content of the skillet to the slow cooker. 2) Add amines, Italian seasoning, salt, pepper, and 2 cups beef broth. Cook on low 4-6 hours or high 2-3 hours. When done whisk in the rice flour to desired thickness. Mix in the Greek yogurt. 3) Serve with whole wheat noodles cooked on the stove. 1) In a large skillet heat the olive oil or high heat. Add the garlic, onions, mushrooms, and beef. Sauté for 3-5 minutes. 2) Next mix in the aminos, salt, pepper, and Italian seasonings. Turn the heat to medium low. Add the egg noodles and beef broth. Cover and let cook 15-20 minutes stirring occasionally. 3) When noodles are cooked turn off the stove. Whisk in the brown rice flour and plain Greek yogurt. Serve. The calculations for the 21 Day Fix are below, this recipe will make 4-6 servings and you’ll just need to measure out 1.5 cup servings to get these container counts, doesn’t get easier than that right? 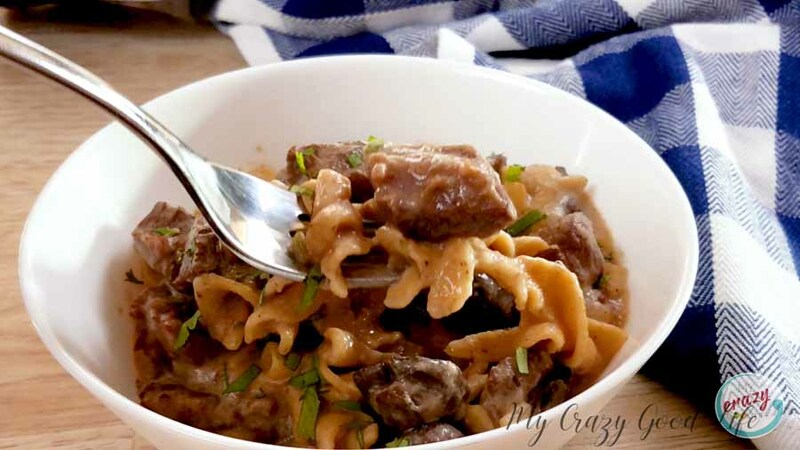 You are going to love how easy and flexible this beef stroganoff recipe is, it’s one of my favorites because it’s so simple! This is feel good food without all the added calories and fat. Healthy feel good food for the win! 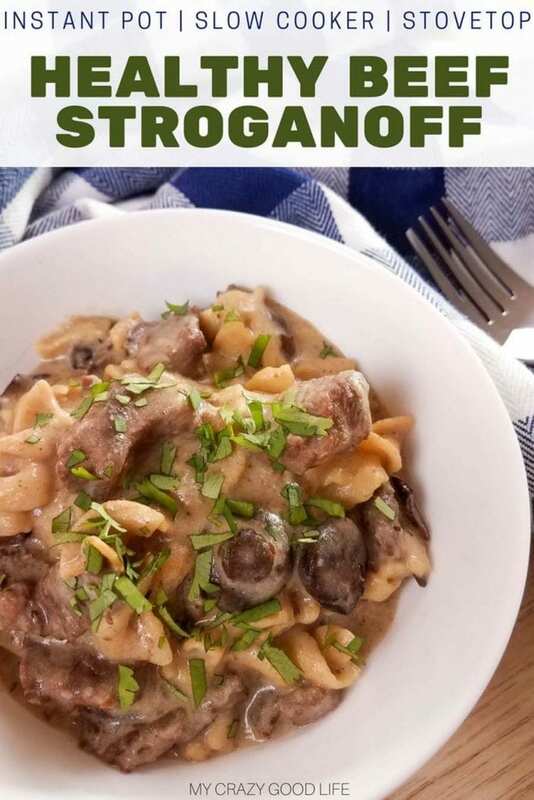 If we are what we eat...I want to be this beef stroganoff. It's so delicious and the whole family will love it, hello to all the meat lovers out there! This is a hearty meal that has been lightened up so you can even enjoy it on the 21 Day Fix. Turn the Instant Pot to sauté. Add olive oil. When the olive oil is hot add the garlic, onions, mushrooms, beef, salt, pepper, and Italian seasonings. Sauté for 3-5 minutes. Next mix in the aminos, beef broth, and egg noodles. Close the lid and turn the pressure valve to sealing. Cook on high pressure for 8 minutes. Let the pressure release naturally. Remove the lid and turn the Instant Pot back to sauté mode. Slowly stir in the brown rice flour to thicken the sauce. Once the sauce is thickened mix in the plain Greek yogurt. Garnish and serve. Sauté onions, garlic, mushrooms, and beef in a skillet on the stove for 3-5 minutes. Transfer content of the skillet to the slow cooker. Add amines, Italian seasoning, salt, pepper, and 2 cups beef broth. Cook on low 4-6 hours or high 2-3 hours. When done whisk in the rice flour to desired thickness. Mix in the Greek yogurt. Serve with whole wheat noodles cooked on the stove. In a large skillet heat the olive oil or high heat. Add the garlic, onions, mushrooms, and beef. Sauté for 3-5 minutes. Next mix in the aminos, salt, pepper, and Italian seasonings. Turn the heat to medium low. Add the egg noodles and beef broth. Cover and let cook 15-20 minutes stirring occasionally. When noodles are cooked turn off the stove. Whisk in the brown rice flour and plain Greek yogurt. Serve. I’m confused with the crockpot instructions. The ingredients call for 4 cups of beef broth, but then you only add 2 cups? What are liquid aminos and what section of the store are they in? It’s like soy sauce. You can find them by the soy sauce or in the organic/natural section. You can use soy sauce too! I’m ready to make this tonight! I don’t have brown rice flour. :/ could I use cornstarch to thicken? If so how much ? I’m new to the Instant pot. Do I use the 4 c of broth or 2 as in the crock pot? What is the rule of thumb for using the instant pot cooking times when converting from slow cooker? I made this recipe this week. I ended up using Tri-Tip beef roast. Very tasty! Thanks for the recipe! Under the crockpot it’s listed to cook HIGH for 23 hours…. I am hoping that is 2-3 hours instead…. Hey Amber! It’s 2-3 hours–I just double checked the recipe and can’t find where it says 23, can you tell me where you saw it so I can fix it, please?